Global spirits company, Beam Inc in collaboration with distributor Maxxium Travel Retail, is launching Laphroaig QA Cask, the second in a series of three Islay malt whiskies created exclusively for the travel retail market and the Friends of Laphroaig on-line community. 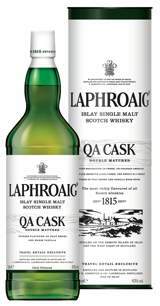 Laphroaig QA Cask is double matured, firstly in ex-bourbon barrels and then in fresh un-charred American oak barrels (Quercus Alba). This second intense maturation creates a fusion of peat smoke balanced with warm spicy vanilla wood notes. It retails at €55 for a 1 litre bottle and has an ABV of 40%. aphroaig An Cuan Mor to be released later this year. The new expressions will be sold through select retailers, including World Duty Free Group, Heinemann and Aelia, alongside Laphroaig 25 year old, the oldest Laphroaig expression. Beam’s EMEA travel retail business manager, Antony Kime, says: “The launch of this exclusive range is a demonstration of our commitment to travel retail, a great environment for the trial and discovery of new whiskies. The Laphroaig QA Cask will also made available to the Friends of Laphroaig, a growing, active on and offline community that links and rewards fans of Laphroaig (over 450,000 Friends worldwide).